Whole Foods Market is taking over America, according to Fortune. They aren’t afraid to charge higher prices. But they also carry a mix of price levels. Their in-house “365 Every Day Value” brand is a relative bargain. While “greener” may mean more expensive for some items, Whole Foods is flexible where they can be. They are a niche, but the niche is getting bigger, and that is due to the efforts of Whole Foods itself. If customers consider your green business a niche, that need not limit you. When I shop Target or Publix, I see more organic foods than ever. They are responding to the pressure of having a Whole Foods in the neighborhood. They re-imagine what a grocery store can be. Whole Foods is focused on food and customers – not just logistics and warehouses. According to co-CEO John Mackey, “Grocery shopping used to be a chore people did – like laundry or taking out the garbage… That’s completely the opposite of what food is.” So Whole Foods is about food and people, and the simple pleasures that can arise from that. They are good neighbors. When they came to my neighborhood, they didn’t just open a store. They put in bike racks to encourage customers to ride over. They put in electric car charging stations with primo parking spots by the door. And they contributed to the local YMCA, which was a few doors down. They’re patient. The first Whole Foods opened in 1980 in Austin, Texas. That’s 34 years ago. Today’s emphasis on speedy returns would get Whole Foods laughed out of an investors meeting. But we would all be the poorer for it. Oh – and Whole Foods is scary profitable. Revenue has doubled and profits have tripled since 2007. Now that’s the kind of sustainable, green business I’m talking about. Phew! What I think of as “Earth Week” is coming to a close. As I reflect on this, a great blue heron is sitting on my pool cage, cleaning his feathers. His presence feels like a good omen to me. 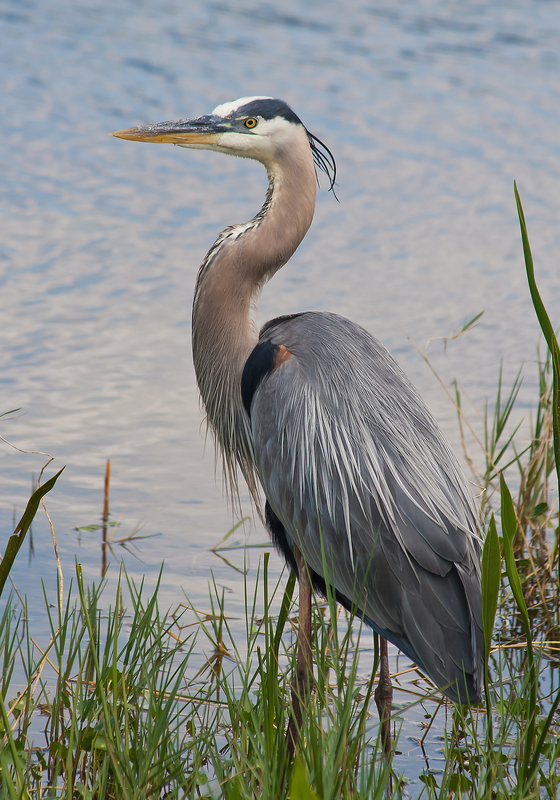 A visit from a great blue heron makes it a good day! Globally, the good folks at Earthday.org report that over a billion people in 192 countries participated in everything from coastal cleanups to peaceful protests calling for cleaner energy. That’s a lotta people. Locally, the Sustany’s Foundation helped celebrate the 10 new “Green Business” designees in the City of Tampa, Florida. The 10 restaurants participated together in a program, tailored to their business, that tackled everything from food waste to recycling. Go Tampa! Individually – I felt privileged to present a webinar on “Green Tips for the Home” to a client. Raising awareness about what a carbon footprint is – and how to reduce it while saving money – is a treat for me. While Earth Day is officially over, for me and every other business that is transitioning to greener operations, it really isn’t over. It won’t be over until our economy – from our buildings to our transportation to our energy grid – is on a sustainable footing. And because I want to hurry the arrival of that day, tomorrow – and all the days after – will be Earth Day too. What did you do for Earth Day? I’d love to hear in the comments! 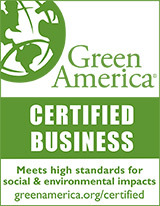 Last week I tuned in to a webinar from Green America’s Green Business Network that explained them. The Green Business Network held a webinar on Clean Energy Victory Bonds. 2 Representatives from California introduced a bill on April 8 in the House of Representatives to create “Clean Energy Victory Bonds.” The idea is based on the “Victory Bonds” that helped finance World War II. If passed, the bonds would be U.S. Treasury bonds of the EE type. They will specifically finance the production of clean energy technologies. The interest will be competitive with other EE bonds. The sectors supported include solar, wind, geothermal, biofuels, electric vehicles and energy efficiency technologies. The face amounts would be as little as $25, so small investors can participate. And redemption periods are very flexible, ranging from 12 months to 30 years. The plan is to sell $50 billion in bonds, with the expectation that that would attract additional public and private investment on the order of $150 billion more. The bonds bypass Congress. The US is losing the renewables race to countries like Germany and China. Bonds take the issue of financing clean energy away from our dithering Congress and put it into the hands of both citizens and investors. The bonds would provide a steady and consistent source of financing. For businesses that never know if a particular government tax credit will be there or not, this form of financing guarantees consistency over the longer term. These bonds enable investors of all sizes to participate. There is plenty of interest and support for this bill. Over 15,000 people coast to coast have already pledged to buy the bonds. And the bill was just proposed. What will CEVBs do for our economy? Create jobs. It is expected that the funding from CEVBs would create over a million jobs. Not just jobs in the future, but jobs right now in areas like construction and manufacturing. This is more jobs than the fossil-fuel sector creates. And the jobs, on average, pay more. Avoid new taxes. This is not a tax. CEVBs would be an investment option, and people who want to own part of the clean energy future can buy in. Improve energy security. As renewable energy options are deployed, the U.S.’s reliance on unstable countries for oil will diminish. And unpleasant oil price shocks will be a thing of the past. What will they do for the environment? 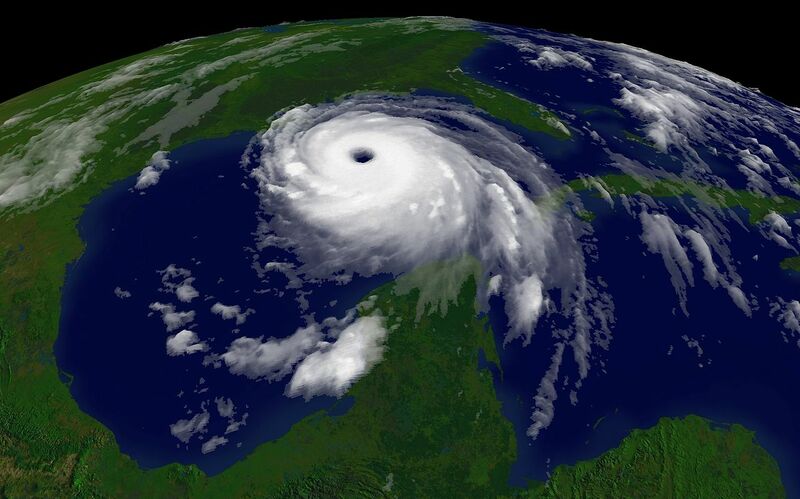 Reduce the likelihood of catastrophic natural disasters (floods, fires, storms) that have become more frequent and more severe as the planet warms. Pledge to buy a bond! Great Green Content has already pledged to support this bill and to buy bonds. Tell your Representative in Washington that you support this bill. The more sponsors, the better its chances for passage. Required caveat: I am not an investment adviser. So use your common sense when it comes to this, or any other, financial decision. “Years of Living Dangerously” – Tune In! I watched the first episode of “The Years of Living Dangerously,” which aired Sunday night on Showtime. James Cameron (of Titanic fame) and an all-star cast – think Harrison Ford, Don Cheadle, Matt Damon and others – have created a big-budget, beautifully-filmed series about climate change. Its multiple episodes do justice to the scope and complexity of the topic. “Years of Living Dangerously” brings climate change to life. And it’s really good stuff. No dry charts of rainfall. No impenetrable scientific models. This series shows you climate change in action – the fires, the floods, the food insecurity that can spark a civil war. You see the pictures of smoke – viewable from outer space – rising over the Philippines because they are burning down their forests to plant palm oil plantations. You hear the story from Lubbock, Texas where a meat-packing plant closed down. The drought in Texas has decimated beef herds. The focus is not on cute cows. The focus is on the good people of Lubbock who are now unemployed because the meat plant – employing 10% of the population – is gone. You listen to Syrian farmers who talk about the connection between the civil war in their country and the unprecedented drought that has decimated their farms. So tune in. There are no sound bites here. Just lots of good information and visually stunning footage of the reality of climate change right now. A tip of the hat to James Cameron and company, and to Showtime for creating and airing this. I know where I’ll be Sundays at 10 pm eastern for the next 8 weeks! “The Big Pivot” is Andrew Winston’s latest book. By “antifragile”, he means a company that doesn’t just survive, but gets better. Like a muscle that strengthens when you exercise it. Diversity – of ideas and perspectives makes an organization stronger. Redundancy, with buffers – Businesses dislike redundancy because it seems like waste. But when auto manufacturers got critical parts from just one supplier – and that supplier’s factory flooded – their operations screeched to a halt. Millions of dollars were lost. Buffers are “the margins that provide the short term breathing space needed to absorb shocks.” Why wouldn’t we set up our businesses with some buffers to better handle extreme situations, especially as those situations are happening more frequently? Speed: Fast Feedback and Failure – real time feedback is powerful. Energy meters that show homeowners their energy use, right now, change behavior. People turn off the lights and ease back on the air conditioning. We also need to fail quickly and reward people for trying, no matter what the outcome. Each failure can points us in new, more promising directions. Modular and distributed design – for example, distributed power systems would protect us from the large, disruptive power outages we have now. I started out bookmarking pages of the book on my Kindle. I stopped because almost every page had an eye-popping statistic or gem of a story. The 5 lines below are just a taste of what’s in the book. Enjoy! Here’s Part 4 of my summary of “The Big Pivot,” Andrew Winston’s latest book. The book is 352 pages, so I offer these posts as a shortcut to understanding the gist of it. We’ve covered the mega-challenges, the Vision Pivot and the Valuation Pivot. The third and final pivot is the “Partner Pivot.” It’s all about collaborating – with government, with competitors and with customers. End Fossil-Fuel Subsidies – and subsidize cleaner energy for a while. We have a short time to eliminate carbon. Subsidies that speed the shift from fossil fuels to clean energy – and then decline – make sense. Pursue Public-Private Investment in the Clean Economy – “The private sector alone cannot build the infrastructure we need for a modern, clean economy.” Government’s track record of success with long-term public-private investment programs includes the birth of the computer age, the federal highway system, the fight against AIDS, and the space program. Implement Higher “Clean” Product and Production Standards – if your product uses less energy than your competitors, why not lobby for a higher standard for all? It will level the playing field, and put your competitors in a tough spot. One such collaborative effort going on right now is The Sustainability Consortium. Established with funding from Walmart, the group is composed of 80 of the world’s largest retailers, including Coke, Clorox, Colgate-Palmolive, P&G, Pepsi and Unilever. TSC’s purpose is to reduce the impacts of global consumption by gathering much better data on the life cycle impacts of consumer products. Using TSC’s footprint data, retailers can better decide what goes on the shelves. It’s a big change for businesses used to thinking only of “cutthroat competition.” But Winston encourages companies to map the “ecosystem” of their industry, identify “hot spots” where joint action can have the biggest impact, and lay out a migration path to lower-carbon solutions. This is a tough one. We live in a “consumer” society, and that mentality is hard to break. Marks and Spencer, the British retailer, has its “Shwop Your Old Clothes” campaign. It encourages customers to bring their old clothes back to the store. M&S makes a “Shwop” coat from recycled items that is half the cost of a virgin wool coat. According to Winston, “when companies say they can’t sell greener products because customers don’t want them, it’s a cop out.” Companies create “needs” all the time. If Marketing focuses on educating consumers about how to make better choices, those messages will motivate action over time. How is your business partnering around the mega-challenges? Here’s installment #3 of my short summary of “The Big Pivot,” Andrew Winston’s latest book. For the “too busy” green business owner or corporate sustainability person, these posts are a shortcut to help you get the gist of it. Yesterday we covered the “Vision Pivot”. Today, we look at the second major “pivot”– or change in direction – that companies must make. He calls it the Valuation Pivot. This pivot, in my view, gets to the crux of the biscuit. The Valuation Pivot is about money and measurement and the very poor job our current businesses do of accurately measuring business value. Winston asks the simple question, “What are people in your company paid to do?” If they are paid to hit the earnings number every 90 days, and not paid for addressing the mega–challenges of a hotter, scarcer world, then the results are predictable. So pay people to address the mega-challenges. Awards are nice, recognition is good. But money motivates action. Make sustainability part of everyone’s performance review, and change the incentives for senior executives. than firms with the least engaged employees. Many employees find sustainability an engaging issue. It’s not surprising. “It’s inspiring to work on something that’s both profitable and for the larger good,” Winston says. Winston is brave to say this. “The problem is, there are many contributors to business value that we fail to put a number on.” These include business resilience, risk reduction, increased sales potential, and easier hiring. Companies pursuing sustainable business practices may adjust their ROI models. Approaches range from dedicating funds for green investments to lowering the hurdle rate to pricing carbon internally. IKEA, for example, lets green projects pay off in 10 to 15 years, instead of the standard 2 years. Ultimately, it’s a leadership decision as to how to evaluate the return on green investments. Natural capital is “everything the planet provides for our economy and our lives, including forests, fisheries, soil, metals, coastal wetlands,” and so on. The list is very long. Valuing natural capital accurately, instead of treating resources as “free”, will help businesses make far better decisions. Here’s the 2nd installment of my short summary of “The Big Pivot,” Andrew Winston’s latest book. Since every green business owner and corporate sustainability person I know is crazy-busy, I offer these posts as a shortcut to understanding the gist of it. Yesterday we covered Winston’s 3 mega-challenges facing business. Today, we look at Winston’s “radically practical strategies” for addressing them. There are 3 major “pivots” – or changes in direction – that companies must make: a Vision pivot, a Valuation pivot, and a Partner pivot. Today we look at the Vision Pivot. Fighting short-termism – Winston says, “Leaders need a much deeper concept than just earnings (which is one particular, warped and narrow view of business success. )” He points to Unilever as one company that has stopped providing quarterly guidance to Wall Street. This frees up management time to focus on the actual business – including longer term investments in sustainable initiatives – rather than yakking about the stock. 2 other ways to deal with “the Street” include educating analysts on how sustainability activities create value, or converting to B Corporation status, which balances profit maximization with goals around people and planet. Setting big, science-based goals – According to climate scientists, we need to keep the planet’s warming to 2 degrees Celsius (3.6 Fahrenheit) to avoid the worst effects of climate change. Winston says that most companies are not using this benchmark to figure out what to do. Instead, they plan their actions based on what they have done in the past. He likens this situation to being on a ship that is filling up with water, and then asking people how much water they think they can bail. That’s not the relevant question. We need to know how fast we HAVE to bail to save the ship from sinking, and then plan from there. One company that’s getting it right is Ford. Chairman Bill Ford – who knows that use of the company’s vehicles represents about 2% of global emissions – has long focused on how to reduce those impacts. The company pursues 3 core strategies: (1) improving fuel efficiency (2) exploring low carbon alternative fuels and (3) developing hybrid and electric vehicles. And they measure how well they are doing against specific, science-based numbers. Pursuing “heretical innovation” – this means “exploring what we take for granted.” It requires “asking disruptive questions and challenging the conventional wisdom.” Winston tells the story of UPS, and how odd it was, initially, to consider re-mapping all their routes to avoid left turns. But that change saves UPS about 85 million miles and 8 million gallons of fuel annually. To me, April is “Earth month.” While Earth Day is April 22, I hope you plan to celebrate the health of our home planet well beyond just the one day. One way I celebrate is by reading about both climate change and the ways different businesses address it. 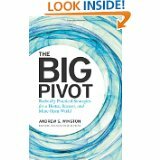 I just finished reading Andrew Winston’s new book, “The Big Pivot”. Andrew is an author, speaker and head of Winston Eco-Strategies. He’s one of the experts I follow on issues around climate change and business. A “pivot” is a turn – a change in direction; and given this headline in the New York Times, we need to make that turn ASAP. The book is definitely worth a read (and no, I don’t get compensated for saying that). My Earth Day gift to you is to summarize the book (over the next few posts) to give you a sense of what’s covered. If something resonates with you about your business, then you’ll want to invest in a copy. The first section of the book echoes Tom Friedman’s “Hot, Flat and Crowded” from 2008. But “The Big Pivot” has more recent statistics and stories – from Superstorm Sandy to the Texas drought to Typhoon Haiyan. Clearly, climate impacts on business are just revving up. More business disruption and loss from a hotter climate. Did you know that natural disasters cost the US over $100 billion in 2012 alone? Scarcer natural resources that make prices for inputs more volatile and likely to rise. For example, the price of cotton rose from 84 cents to $2.29 per pound between July 2010 and March 2011 – in part due to floods and rain in cotton-producing regions. More transparency in business. From cell phone cameras that can document poor working conditions to demands for more information in corporate sustainability reports, businesses face pressure to be clear about what goes into their products and services. Climate change helps drive the rise of the “clean economy” – a diverse and growing sector of the economy. Resource constraints are happening because there’s a huge new global middle class demanding a higher standard of living. Business needs to find sustainable ways to meet those demands. Transparency also presents opportunities for businesses to collaborate and innovate in solving climate issues in ways that business can also benefit from. Why? Because “it’s ludicrous to prioritize short-term profit at the cost of our very survival.” Agreed. This past weekend I was in New York City. It’s one of the world’s great cities – and not just because I was born there. 🙂 It’s also a city striving to become much greener than it is today. And it’s fun to see the many ways that greener reality takes shape. Leaving my hotel on 8th Ave, I was amazed to see a bike path along this busy, major road. Not a skinny path squeezed alongside as an afterthought. This was a wide, well-marked, well-paved section of the road reserved for cyclists. 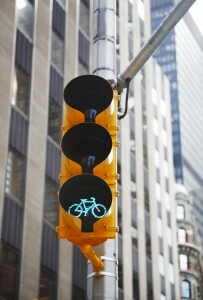 There are even traffic signals specifically for cyclists. 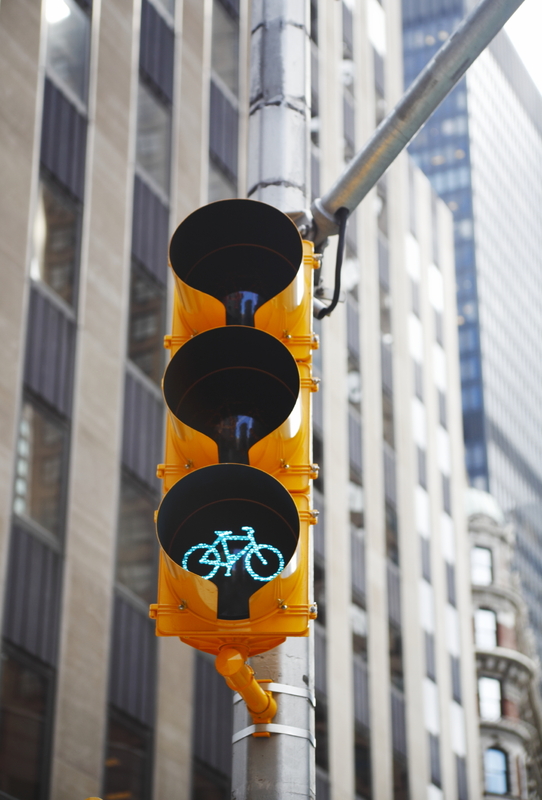 Cyclists in NYC have dedicated bike paths, and traffic signals. As I walked (on the sidewalk), helmeted riders whizzed by in their lane, unfazed by the sub-freezing temperatures. Some were riding bright blue Citi Bikes, which belong to the city’s bike sharing program. (No, I am not paid by Citi Bike.) With thousands of bikes and hundreds of pick-up and drop-off bike stations throughout the city, you really can bike from point A to point B very quickly without waiting for a cab, bus or subway. Produces no greenhouse gas emissions. All New Yorkers benefit from cleaner air and no greenhouse gas emissions when a fellow citizen grabs a bike instead of driving to their destination. Provides safety and speed for cyclists. The designated bike paths make biking in NYC much speedier and safer than before. Cyclists don’t risk their lives by jockeying for position in lanes full of yellow cabs, cars and buses. Offers convenience and flexibility. There are literally THOUSANDS of bikes and hundreds of bike stations throughout the city now. There’s no hunting around to find a bike, or a place to park it at a destination. Builds better health. People who cycle regularly are rarely fat. I envy New Yorkers who can combine their commute – even on some days – with their exercise routine. Talk about a win-win. Remember – this year’s Earth Day focus is “Green Cities”. If you’re going to be in New York City around April 22, check out these Earth Day events.